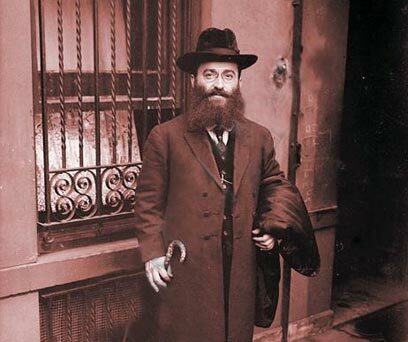 Making a comeback: Largely considered the greatest cantor in the 20th century, Josef "Yossele" Rosenblatt died in Jerusalem 75 years ago. His creations turned into assets of permanent value in the world of chazzanut (cantillation) but for years, it has been difficult to obtain quality recordings and especially not on CD. However, the situation has recently changed. The Aderet Music Company has taken the monumental and unique initiative to bring the old records to light. Essentially, all of Rosenblatt’s recordings were done in the early 1900s while the recording industry was at in its infant stages. Some of them were even done personally by Thomas Edison, who invented the phonograph and the gramophone. In light of the underdeveloped technical abilities in those days, Rosenblatt’s recordings suffered from a low sound quality and from noises which harm the quality of music and musical experience. Now however, due to new technologies, Aderet managed to revive the original sounds and clean them up. They also added musical accompaniments and the outcome is an album entitled “Od Yosef Chai,” a rare musical experience, revitalizing Rosenblatt. Rosenblatt was most likely the most famous cantor of all times. Even 100 years afterwards, his creations are delightful and popular and many have recorded versions of his cantillations. He was born in the Ukraine in 1882 and wandered for most of his days from country to country. He originally traveled around Eastern Europe where he served as a cantor in various communities. Later, he arrived in the United States where he became a star. He became the official chazzan in the Hungarian community synagogue in New York and there he received a high salary for his singing and services. Rosenblatt became a real star and was invited for prayers and performances throughout the entire US. He participated in many contributory events and when World War I broke out he managed to raise the then-unfathomable amount of $240,000 for refugees. He also received numerous offers to perform in different concerts but turned many down since they were not in line with his religious beliefs. In 1927, Warner Bros. suggested that he participate in “The Jazz Singer,” the first feature-length motion picture with synchronized dialogue sequences, but he refused. He only agreed to contribute a song to one of the scenes. During his time in the United States he experienced economic difficulties due to business dealings he had with crooks who convinced him to become their partner. He was forced to cover the huge debt by an innumerable amount of performances and concerts. In 1933, Rosenblatt and his family made aliyah and his fan base in Israel was vast as well. He frequently performed and affirmatively answered almost all requests to join in on one charity concert or another. His associates and friends said that he looked worn out and felt that he was working too hard but Rosenblatt found it difficulty to refuse requests. In the summer of that same year, Rosenblatt stood before the column of a Jerusalem synagogue and touched the hearts of all those present. The following day, he drove to Rachel’s grave where he sang with full intent and then drove to the Dead Sea. When he returned home he felt horrible pain. A doctor who examined him told his family members that he had a heart attack and told him to rest. That afternoon Rosenblatt prayed minhah (afternoon prayer), returned to his bed and then a loud moan was heard in the house. Rosenblatt retrieved his body to the Creator. Thousands accompanied him on his last path. Israeli cantor and stage performer Dudu Fisher says, “Rosenblatt’s uniqueness was in that he would add a very catchy tune. He was a voice artist. He had an amazing opera voice and it is said that many of the greatest opera singers came to hear him. See all talkbacks "The father of all cantors "